my folks were here last week, and we worked on all sorts of projects. my mom taught me how to refinish furniture! we did the dining room table (still have to do the chairs) and it looks beautiful. that is for a separate post once the chairs are done. we went to st. vincent’s on the prowl for a tv stand or entertainment center. in the process of moving, a board broke off the old entertainment center (the one i got from my college roommate for $10 – that she got secondhand as well – between the two of us, we got 8 years of use out of it). it’s for our extra tv for the spare room, which is upstairs, so we wanted something smaller, lighter, and easier to get in the house. we found this corner stand for $18, refinished it, and voila – like new! 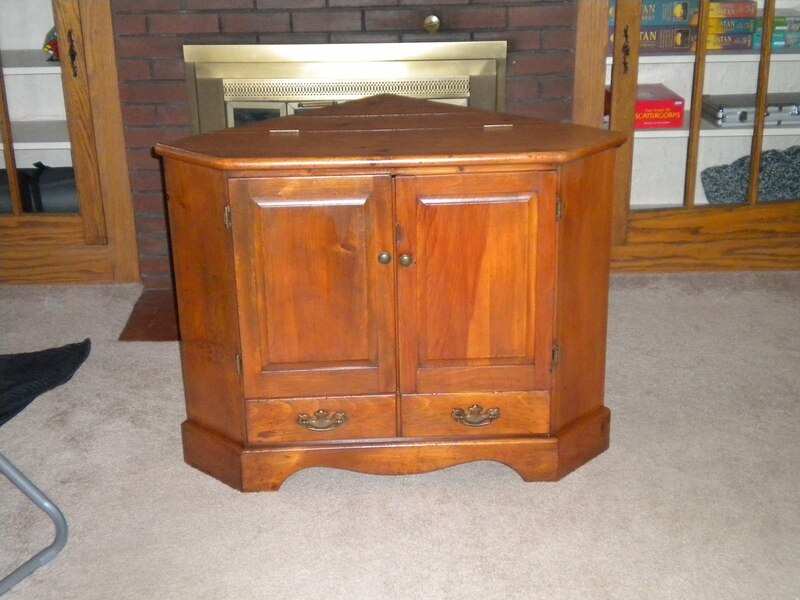 This entry was posted in Home Projects and tagged furniture, home projects, refinishing, thrift shop, tv stand. Bookmark the permalink.